Clean and protect your t-top as much as it protects you! 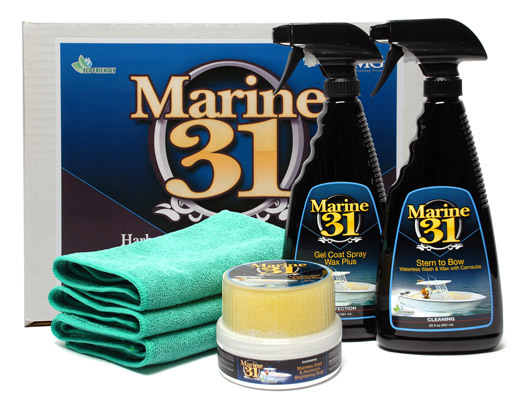 Marine 31's Ship Shape Boat Care Kit is equipped with the products you need to keep your boat's t-top looking great! Nothing displays your passion for boating like a well detailed craft. All products in this kit are eco-friendly and harbor-safe. Marine 31 Gel Coat Spray Wax Plus creates a highly-protective shine in just minutes! Marine 31 Gel Coat Spray Wax Plus was formulated in nautical environment of south Florida. It is a blend of carnauba wax and engineered polymers designed add valuable protection and shine quickly. Marine 31 Gel Coat Spray Wax Plus is easy to fast-acting and easy to apply. Marine 31 Gel Coat Spray Wax Plus is perfect for those moments when the sea is calm and the water beckons. In just minutes you can have substantial protection that is salt-resistant, harbor-safe and ecologically friendly. A Tip From The Captain�s Chair: T-Tops give your boat a nice appearance and provide protection from the sun. Unfortunately they are constantly exposed to the environment. 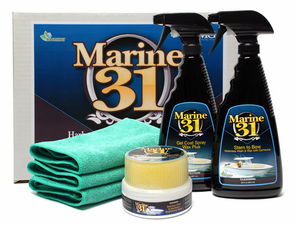 Use Marine 31's Executive T-Top Boat Care Kit to keep your top looking brilliant.